How does that song go? "Heaven, I'm in heaven...." I sure was during a 2008 visit to the Spam Museum in Austin, Minn. It was Spamtastic! 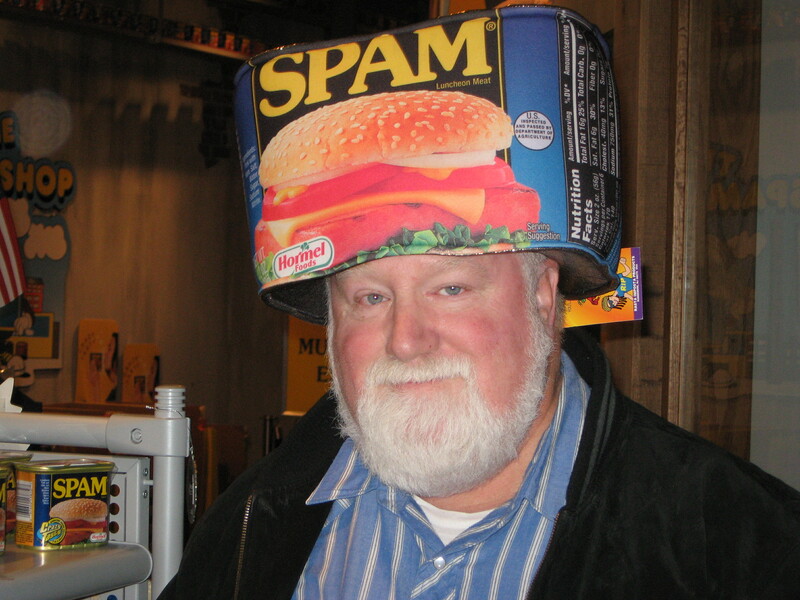 For a long time people have been making fun of and/or laughing at Spam. I’m talking about the processed luncheon meat made from pork and chicken, not junk e-mail, which is no laughing matter. The makers of Spam, Hormel Foods, have taken the ribbing nicely. But now they are doing some guffawing of their own. All the way to the bank. The Austin, Minn.-based company reported a 14 percent increase in quarterly profit in May, aided among other things by more sales of Spam. I’m not afraid to admit that I like Spam, and I eat it now and then. But before my cattle- and hog-producing friends grab their chests and pass out, let me reassure them that as much as I enjoy Spam, it will never replace a thick steak or a juicy hunk of ham on my favorite meals list. Spam comes in a can and doesn’t need to be refrigerated until it’s opened. It’s easy to prepare, too. It’s pre-cooked, so you just take it out of the can and eat it cold. Or you can fry, grill, bake, broil or microwave it. It’s relatively inexpensive and, in my opinion, tasty. The museum has displays regarding Spam’s proud history, like when it fed GIs in World War II. You can see how Spam advertising has changed over the years — even though the product hasn’t. And you can try to package a can of Spam in a race against the factory. Sorry, you’ll lose. Perhaps predictably, you’ll end up in the Spam Shop, where you can see (and buy) every Spam item imaginable, including the many varieties of Spam that your grocer may not stock. So why are Spam sales on the increase? Analysts say it’s because people are turning to lunch meat to stretch their food budgets. And Spam can be used in a variety of ways, such as diced in an omelet or sliced in a sandwich. The Agriculture Department reports that food prices went up 4 percent — some individual items have risen much more than that — in the United States last year. That’s the fastest increase since 1990. And the USDA says the Consumer Price Index for food is expected to increase 4.5 to 5.5 percent this year as retailers pass higher commodity and energy costs on to consumers in the form of higher prices. Spam is up in price, too — nearly 7 percent over a year ago. But a 12-ounce can runs only about $2.62, and shoppers who apparently think that’s a good value have been buying more of it. So laugh at Spam if you will. Hormel is chuckling, too, and waiting for your visit to the grocery store and the Spam Museum. Copyright June 25, 2008. All rights reserved. This “Everyday People” column appeared in The North Scott Press, Eldridge, Iowa.